Some Basics and Examples on 3D Animation. How to animate a rolling chain for bikes, conveyor belts and other engines. How to roll a roller chain? First we have to understand the geometry of two circles with their externel tangents. The length of the linear parts: 2·t = 2·sqrt( d2 - ri2). The angle of the chain: α = asin(ri/d). The segment of circle 1: l1 = 2π·r1 ·(180+2·α)/360. 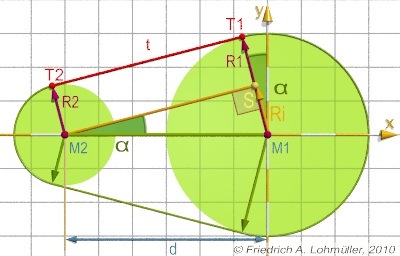 The segment of circle 2: l2 = 2π·r2 ·(180-2·α)/360. For placing the chain links equidistant on the belt line we have to divide the lenght by the number of chain links (for bike chains we have 2 different types of links, so we need an even number of chain links !). 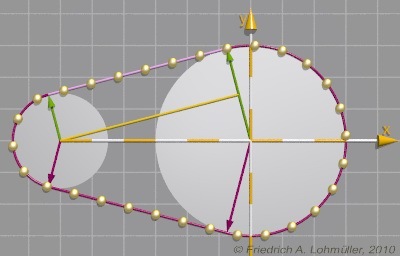 The geometry of 2 circles with externel tangents! The positions for the links of a roller chain. Animated positions for the links of a roller chain! Continue with two diffent kind of chain links here: Bike Chain.